You guys are the SHIITAKE!! 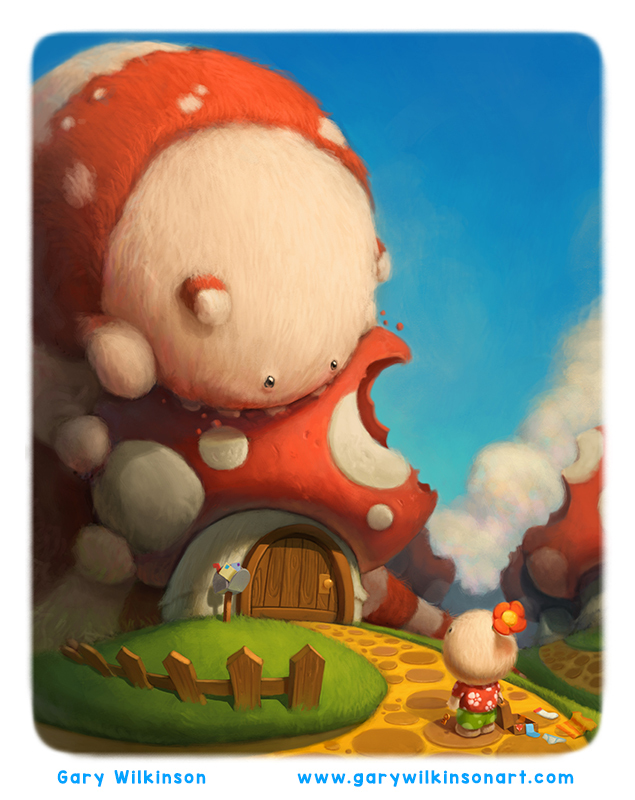 We got a whopping 80 entries in our MUSHROOM VILLAGE art contest this month! Thanks to all who took part! With that, congrats to Gary Wilkinson, who took first place with his mushroom munching marauder! Per Lee White, who judged the contest: "After quite a few strong finishes, I have to give Gary the win on this one. It is just too good to ignore. Clever concept followed by very strong technique is what drew me to this one. What I really appreciate is how appropriate, yet peculiar the concept is here. Nature does like to use disguises and then ATTACK! Gary nailed it." 1st Place! Illustration by Gary Wilkinson. 2nd place went to Carrie Copa, who created a captivating little world amongst the mushrooms. Per Lee again: "Carrie's piece was so charming and reminded me of watching a really good animation. It made me want to know more about what is happening with these little guys. I love the toned palette and cozy lighting too!" 2nd Place! Illustration by Carrie Copa. 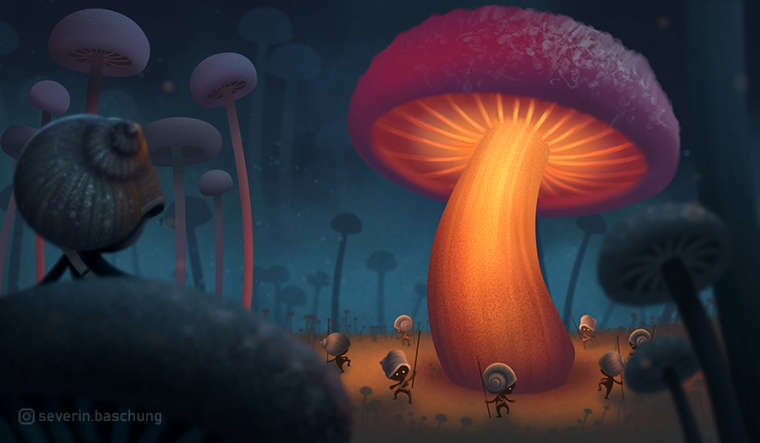 Severin's piece brought a sense of magic with his mystical glowing mushroom. "Severin really killed it with the lighting and color balance in this piece. I saw some earlier versions that had some glowing writing on the mushroom which I liked too. I think this world and lighting should be explored more. Maybe 3 images in a series for this one would be great portfolio material." 3rd Place tie! Illustration by Severin Baschung. Marek's piece made us chuckle with its fun character design and flying pigs (flying pigs are pretty much always funny). "This was a very funny take on the topic and absolutely stellar painting technique here. Has a bit of an animated Chris Van Allsburg feel to it or perhaps David Weisner (both Caldecott winning illustrators!). Not bad company to be in for sure." 3rd Place tie! Illustration by Marek Halko. Lee also ended up picking 6 more illustrations as honorable mentions 😀🏆💕 Check 'em out (with his comments) below! "This piece drives home the importance of showing an interesting point of view in your images. The composition and scale and all the details work together so well here. "Great flowing design and controlled color balance on a full color piece (not so easy to do). I definitely want to see more from Matt!" "The sense of adventure in Rachel's image is so engaging. I like how she kept the complicated design and details for the city and kept it simple with the characters so it doesn't get too busy. "I LOVE the color balance here. The greenish cools are balanced out nicely by the warms. This has a very 'Dreamy Summer' type feel which is particularly engaging to me." "I love this painting. It's magical and well painted. I do keep worrying about that bird wanting to eat the main character which adds tension to the image. That may be totally unintentional by Corina. I'd like to hear if you guys feel any danger for the character. The bird does look sweet, but if he gets hungry, watch out! : )"
"This is another take on the subject that I never anticipated. You guys always manage to surprise me! The old man in the workshop toiling away on his lovely craft is an awesome idea. Nice touch with the strawberry light thingy too! Older PostJune Art Contest: Mushroom Village!